HART stands for "Highway Addressable Remote Transducer Protocol" and is one of the most widely used protocols in use today for communicating over analog instrumentation wiring. Originally developed by Rosemount Inc, it eventually became an open protocol which is continually being enhanced. The MFC 4150 Meriam HART communicator is available for purchase and rental from EES Singapore. The HART communicator distributed and stocked by Eastern Energy is designed to connect to HART devices which enable operators to know how the device/s current status, configuration with the ability to retrieve diagnostics and maintain/control and diagnose field devices such as control valves, positioners and other HART enabled instrumentation. The beauty of HART is that you are simply using a two wire connection. 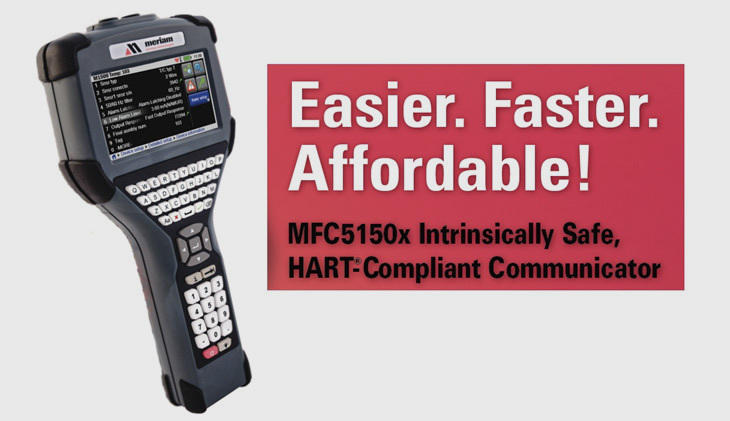 One of the big advantages of the MFC 4150 HART communicator is that it only takes about 15 seconds to go from “off” to connecting to the device. Simple jack connections at the top of the communicator get you connected easily and you will be talking to the device in no time at all. The unit can be run on AC power and also connected to a PC to renew firmware files or even add HART communication files. Easy updating in the field means you do not have to be send the device back to the vendor. ATEX APPROVED MERIAM HART COMMUNICATORS - INTRINSICALLY SAFE ATEX ZONE 0 & CLASS 1, DIV 1. Reads manufacturers' DDs in their native format from any HART registered or unregistered device. No translations needed.